The Timber’s season opener was tonight. I happen to be there after my initial plan to watch at a local sports bar was deterred by the simultaneous broadcast of the Blazer’s game. I am not a big basketball guy and even tho there were two small screens with the game on, the volume was not, and the crowd was thick. With 5 minutes before the start of both games, I decided to take the train 15 minutes to the stadium and see if I could get cheap ticket. Turns out when you are late and tickets are still around on the street, a good deal can be had and into the game I went. 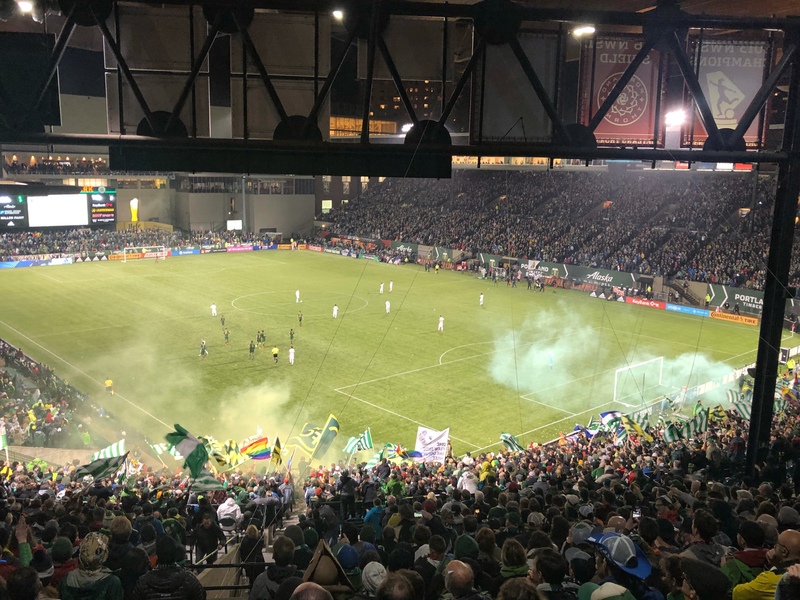 The only problem with going into the home opener game late, with a general admission seat, is that despite the Blazer’s game, this is a soccer city and everyone was there. Full house. The seats I landed in would be ok if you don’t mind having a whole corner of the field obstructed. My distress call was answered and I found some friends with much better seats and a little room for me. They went on to win their first game of the season after a 4-1 lead was changed to 3-2 when our goal was overturned and a few minutes later we scored on ourselves. At that point I actually got confused and I thought the game was tied for a good 10 minutes before my friend reminded me that the scoreboard was correct. I don’t even need to say it. This day was already a winner well before the Timber’s escapade. I had a nice long sit today, did some exercise, had a great guitar practice session and played around with a making a nice dark back background to get flowers to really pop. Love the flowers! They really do pop and float! Glad you got into the game! Isn’t Portland great? Basketball and soccer at the same time! Each day is like playing soccer, you have to give it your best shot. And some days the shot really comes up a winner. But either way, being in the game makes the day pop with gratitude.